Check out some other museums that feature Franklin automobiles. The Franklin Auto Museum™, maintained by the Thomas H. Hubbard/H.H. Franklin Foundation, is located in Tucson Arizona. Click here to visit the Museum web site. The Northeast Classic Car Museum in Norwich, NY has over 160 classic and vintage vehicles on display. Exhibits include the Fabulous Franklins, Cars Made in New York State, the Post-War collection and more Click here to visit the Museum web site. Watch a video photo display of the 1904 trip from San Francisco to New York in an air-cooled Franklin car. The H.H. Franklin Club, Inc. as a 501(c)3 non profit Club provide to the public and Club Members this web site for the purpose of preserving, sharing and educating all interested parties on the history of the Franklin Automobile Company, it's subsidiaries, and the Franklin Automobile. The site is promoted and maintained as a repository for technical data, historical data, service data, question and answers, photographs and video clips of cars in the past and present with current owners as well as past, automobiles and parts for sale, upcoming and past events, related site links, membership news, with a limited emphasis on social media interaction for members of the H.H. Franklin Club. 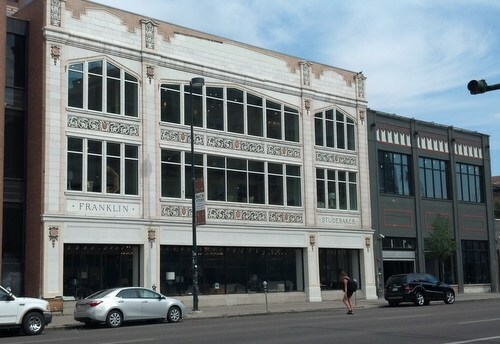 This Franklin Dealership from the early 1920's is still standing in Downtown Denver. Click here to read about this building and its history.